A crochet maker interested in creating a wrap to wear at a party or as a gift can choose to make a standard wrap or an intricately designed one. A bridge net wrap is a type of intricate, beautiful design that can accompany any causal or formal attire. 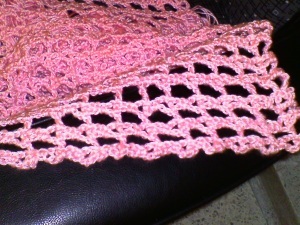 The bridge net wrap, once finished, resembles a wrap made of lace instead of yarn. 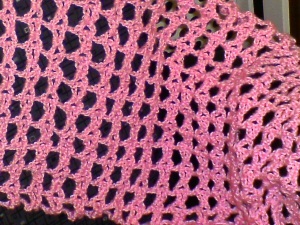 Creating this type of wrap requires Simply Soft yarn and E/6 (3.25 mm) crochet hook. For a crochet maker interested in adding a creative flair can add tassels or fringes to the end of the wrap. Crochet a foundation row of 84 chains with your size crochet hook and yarn. Chain an additional 5 chs to your foundation chain (ch) for a total of 88 chains then work a single crochet (sc) in the 8th chain from your crochet hook. Ch 2, skip 2 of the foundation chain, work a dc in the next chain,* chain 2, skip the next 2 chs, sc in the next ch, ch 2, skip the next 2 chs, work a dc in the next ch* repeat across row from* to *. Chain 8, and turn your work. Row 1 finished. Skip the first dc located at the base of your ch-8,* dc in the next dc, then ch 5, turn * repeat across from * to * ending dc in the 3rd ch of turning ch. Chain 5. Row 2 finished. Insert your hook in the first ch-5 arch and work a sc over the ch-5 arch space, ch 2, dc in the next dc, ch 2, then sc over the next arch space* repeat across from * to * , ending with a ch 2, and working a dc in the 3rd ch of the ch-8. Repeat row 2 and 3 to continue in the bridge net pattern. Continue to work in pattern until your wrap measures inches—or the desire length needed. Fasten off. Cut all loose end and weave them into your wrap. Measure a piece of cardboard 5” wide x twice your desired length. Fold the cardboard in half for example, the folded cardboard measure 5”x 4”. The unfold cardboard will measure 5” wide x 8” in height. Cut a strand of yarn about 10” in length. Then insert the yarn between the fold cardboard. The strand of yarn will become your tassel tie. Wrap the yarn around your cardboard about 12 times. The more you wrap the yarn the fuller your tassel will become. Hold the wrap cardboard on a flat surface with one hand. Then grab both ends of your yarn/ties with the other hand and pull it down to the open end of the cardboard. Once the yarn or tie is down make a knot around the wrapped yarn. Cut the opposite end of the yard along the fold to free your tassel from the cardboard. Tie a piece of yarn around the top half of your tassel to make a bundle. Make as many tassels a needed. Place tassels in every other triangle at the long length of your wrap.